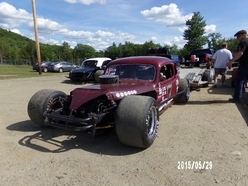 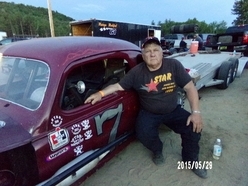 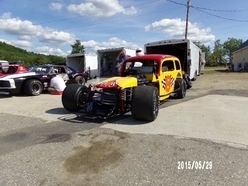 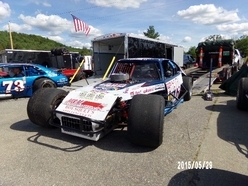 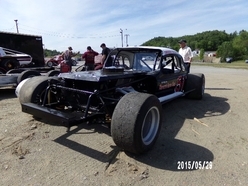 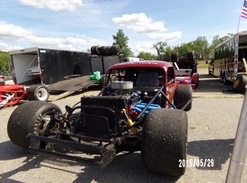 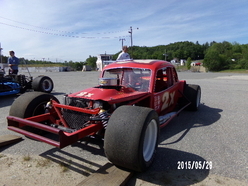 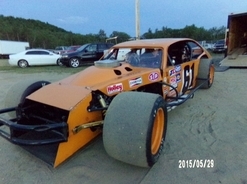 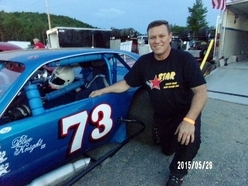 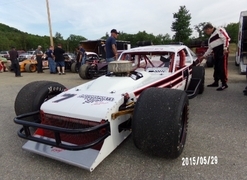 The season kicked off for the Senior Tour Auto Racers on May 29th at the Claremont Speedway, Claremont, NH, and let me tell you that you know where STAR was pitted by the laughter and joke pranks going on. 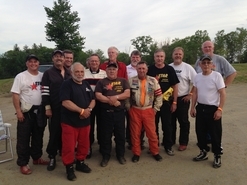 You never know what these guys will do next! 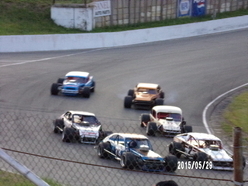 Never a dull moment! 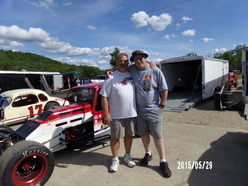 It was great to see the new owners of Claremont Speedway and their staff joining in to give STAR a very warm welcome! 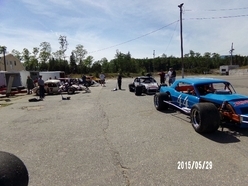 Then it was time to get serious, with all cars to be inspected before practice time. 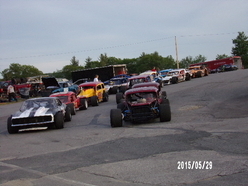 It was nice to see all the Board of Directors of STAR on hand to make sure all cars were in regulation and ready to hit the asphalt. 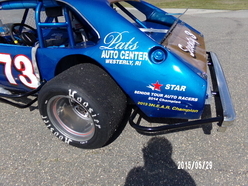 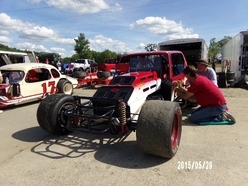 The evening would bring the STAR group multiple warm ups and heats and features for the Sportsmen and Modfied divisions. 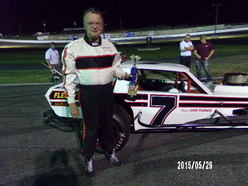 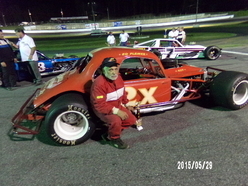 Skip Stearns from NH in his #7X coupe took down the first checkered for the tour for 2015 season by taking the win for the Sportsmen heat. 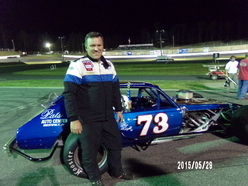 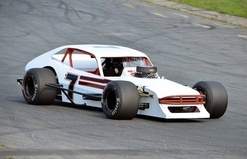 Scott Poirier from Ct in his #73 Pinto took down the next checkered for the tour by piloting his Pinto to victory lane for the Modified heat win. 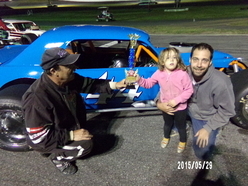 At feature time, STAR was honored by entering the track lined up while the National Anthem was played. 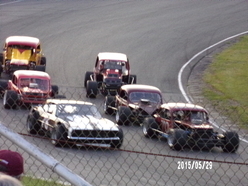 Then announcer Andy Hall gave the command, “Gentlemen Start Your Engines”. 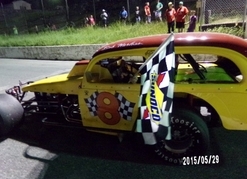 As a tradition at Claremont Speedway, George Powers started them standing on the front stretch with the cars flying by him on both sides, restoring an age old tradition to the Claremont Speedway. 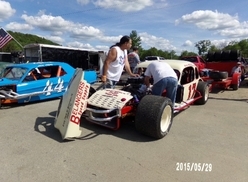 This is the way races were started in the early years of the sport and for the last seventeen years Powers has been doing this with STAR. 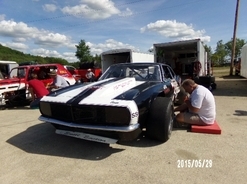 The fans cheered him on and it was off to racing for the Senior Tour Auto Racers. 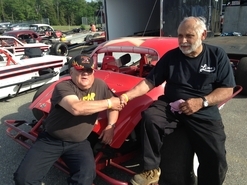 When the features were over the top three from each division came to victory lane for an out of the car interview and awarded with trophies. 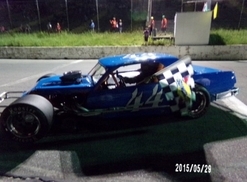 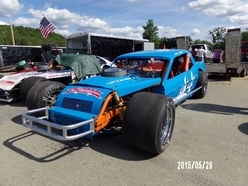 First James Allen from Ma in his new Mustang #44 for 2015 took the “Victory Lap” for the Modified division, then passing the flag to Robert Harless from NY in his #8 sedan to take his “Victory Lap” for the Sportsmen division. 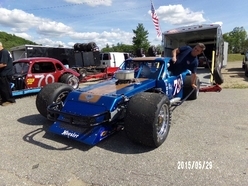 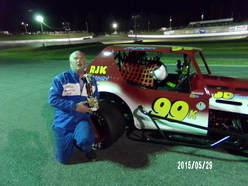 In the Sportsmen division it was Charlie Lima from Ma in the 2X coupe to take second place finish and 3rd place finish was awarded to Joe Keefner from Ma in his #99 Gremlin. 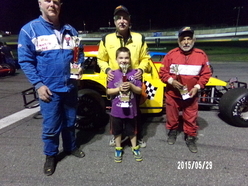 The feature winners James Allen and Robert Harless picked two young children from the fans and brought them down on the track to take pictures with them and give them their trophies to remember STAR by. 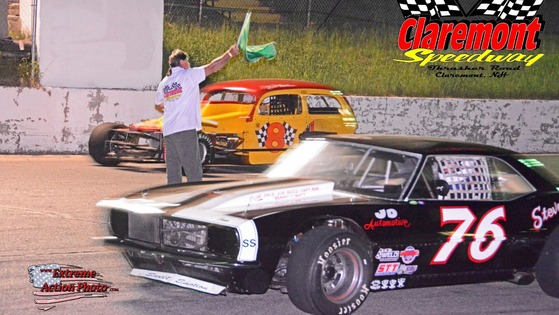 Senior Tour Auto Racers would like to thank Claremont Speedway and its entire staff for all their hospitality and making it a great “Night to Remember”.